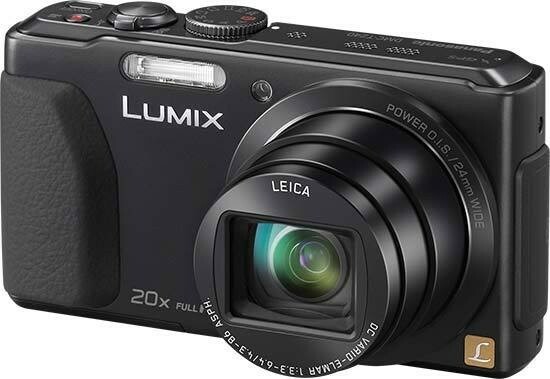 The Lumix DMC-TZ40 (also known as the DMC-ZS30 in the USA) is Panasonic's latest travel-zoom camera, featuring a 20x 24-480mm lens, 18.1 megapixel high-sensitivity MOS sensor, 50p Full HD movies, 5-axis image stabiliser, built-in Wi-Fi and GPS connectivity, a 3-inch, 920,000-dot touchscreen LCD, and fast burst shooting at 10fps. The Intelligent Resolution function can be used to digitally boost the zoom ratio to 40x with hardly any loss in quality, or to simply make still images and video look better, at least according to Panasonic. The TZ40 also offers a 23-point multi-area autofocus system, A, S and M exposure modes for creative photographers, Intelligent Auto and a variety of scene modes for beginners, and Creative Controls, Creative Panorama, Creative Retouch, Auto Retouch and HDR modes. A Light Speed auto-focus system, Venus Engine VI processor, POWER O.I.S. anti-shake system and a 3-inch LCD screen complete the headline specifications. The Panasonic Lumix DMC-TZ40 / ZS25 is available in silver, white or black for £329.99 / $399.99. The flagship Panasonic Lumix DMC-TZ40 looks almost identical to the cheaper TZ35 that we reviewed last month, but it packs quite a lot more features into its very similar body. The Panasonic Lumix DMC-TZ40 is slightly smaller and lighter than the previous TZ30 model that it replaces., but Panasonic have still somehow fitted in a 20x zoom lens, equivalent to 24-480mm on a 35mm camera, which provides an incredibly versatile focal range that will cover every subject from ultra-wide angle landscapes to close-up action shots. Even when set to 480mm, the lens doesn't extend too far from the front of the TZ40, making it look to all intents and purposes like a "normal" compact camera. This helps to make the DMC-TZ40 great for candid moments, as people assume that you're using just a standard point and shoot with a much more limited range. At the other end the 24mm focal length provides an entirely new wide angle of view that can only increase your creativity. You won't want to go back to a "standard" 35mm zoom, or even a 28mm one, after using the 24mm lens on the DMC-TZ40 - 4mm at the wide-angle end really does make a big difference. The 20x zoom lens makes this one of the most versatile compacts in terms of focal range, especially as it is coupled with Panasonic's excellent POWER O.I.S system, which helps to ensure that the majority of photos taken in good light are sharp. The TZ40's lens isn't particularly fast at either the wide-angle setting, with a maximum aperture of f/3.3, or the telephoto setting, with a maximum aperture of f/6.4, but given the focal range on offer, we feel this is a compromise worth making. The DMC-TZ40 is a well-built camera with a high quality metal body. The design is dominated by the 20x lens on the front and the large 3 inch LCD screen on the rear. There is no optical viewfinder, which does make the camera a little harder to keep steady at the telephoto end of the zoom than holding it up to your eye. There is a new rubberized handgrip on the front of the TZ40, a big improvement on the TZ30 and chunkier than the TZ35, and a small textured area on the rear. The TZ40 actually has a 18.9 megapixel sensor, but only uses 18.1 megapixels so that it can offer four different aspect ratios - 4:3, 3:2, 16:9 or 1:1 - without having to change the angle of view. The Multi Aspect mode takes an image in all four aspect ratios simultaneously and lets you choose the best one. 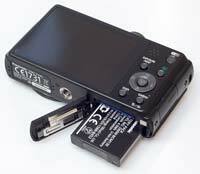 The DMC-TZ40 is well-made overall, although we still don't like the cover for the battery compartment and SD card slot, which feels a little insubstantial and is locked using a cheap plastic switch. 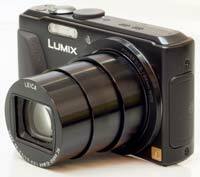 Despite the inclusion of a full range of manual shooting modes, the Panasonic Lumix DMC-TZ40 is not overly complex in terms of the number of external controls that it has. The majority of the controls are clearly labeled and common to most cameras, with the Q.Menu and iA shooting mode being specific to Panasonic and requiring a quick read of the user guide. There's a traditional shooting mode dial on the top of the TZ40 which has a positive action and lets you select the various shooting and scene modes. This dial is a typical feature of SLR cameras, and enables you to quickly change between the various modes. Interestingly there are two Custom modes available, C1 and C2, which can be used to provide quick access to different settings and allow some customization of the camera setup, very handy if you often use the camera for different subjects or situations. The DMC-TZ40 offers advanced controls over exposure, with full manual (M), aperture-priority (A) and shutter-priority (S) modes on offer, which will instantly appeal to the more experienced photographer. The range of apertures on offer is rather limited by the lens (F3.3 - 8.0 at 24mm and F6.4 - 8.0 at 480mm), but the ability to choose from 60 - 1/2000th second shutter speeds and set both the aperture and shutter speed if you wish opens up a lot of creative potential. Sadly there's still no support for the RAW file format, which would really have been the icing on the cake for serious photographers looking for a backup-pocket camera to their DSLR. The DMC-TZ40 features Panasonic's now well-established Intelligent Auto Mode. Panasonic have tried to make things as easy as possible for the complete beginner by providing this shooting mode, which allows you to point and shoot the camera without having to worry about choosing the right mode or settings. Intelligent Auto Mode automatically determines a number of key criteria when taking a picture, including selecting the most appropriate scene mode and ISO speed, and turning face detection (up to 15 faces), image stabilization and quick auto-focus on. Intelligent Exposure increases the exposure only in the under-exposed areas of the image, and Digital Red-eye automatically detects and removes red-eye. Intelligent Exposure can also be turned on in the Normal Picture mode (but strangely not Digital Red-eye). The DMC-TZ40's built-in GPS system allows you to seamlessly geo-tag your photos (latitude and longitude co-ordinates are stored in the EXIF data, plus the local time) and then sort and display them using geo-friendly websites such as Google Earth and Google Maps. The DMC-TZ40 has a built-in database of over 1 million known landmarks around the world, which it uses to try and tag each image if enabled, and the GPS system has been further enhanced by incorporating GLONASS technology, a Russian GPS system which offers improved coverage. In addition you can choose which specific information is set for your photos, with Country/Region, State/Prov/County, City/Town and Landmark the available options. The TZ40 offers the ability to view your tagged photos on a map in the camera, with 90 detailed country maps supplied on a DVD which can be copied to an SD card, although it's a little simplistic compared to the internet options. The GPS can be manually turned on or off - when enabled, it continues working even when the camera is switched off. There's also a special airplane mode which only keeps GPS on when the camera is switched on. The GPS Info option shows you exactly which satellites are being used and importantly when the signal lock was last obtained, with the option of manually updating the positioning process. This last option is important because the DMC-TZ40 has a tendency to keep using an old position if you, say, catch the London tube and travel a few miles underground, in which case it needs to be manually updated. Other than this idiosyncracy, the TZ40's GPS receiver works a lot better than previous GPS-capable cameras that we've reviewed, saving accurate positioning information for most of the images that we shot in built-up central London, making this camera much more useful for urban photographers. The main downside of the TZ40's GPS is the subsequent drain on battery life, with the camera only managing just over 225 shots with GPS turned on instead of the 300 that it can manage without. The new Wi-Fi functionaility (IEEE 802.11 b/g/n) lets you use your smartphone or mobile device to remotely change the camera settings (focus setting, exposure compensation, ISO, WB and Photo Styles) using the LUMIX App. You can even operate the 20x zoom and fire the shutter button remotely, while the auto transfer function automatically backs up your photos onto a tablet, smartphone, PC, web service, AV device or Panasonic's LUMIX Club Cloud Sync service. The DMC-TZ40 is also one of the very first cameras to feature NFC (Near Field Communication) technology (the same technology that's used for mobile payments), which allows you to connect the camera to a compatible internet enabled device or another TZ40 by simply tapping them together. Completing the top of the camera are the Off/On button, responsive zoom lever, tactile shutter button, holes for the stereo microphone and for the speaker, and the one-touch Movie Record button. The TZ40 offers stereo sound which used in combination with the Wind Cut menu option makes a real difference to the sound quality in movies. The TZ40 can record HD video at 1920x1080 pixels at 50p (FHD: 28Mbps / AVCHD) (Sensor output is 50fps), 1920 x 1080 pixels at 50i (FHD: 17Mbps / AVCHD) (Sensor Output is 50fps), or 1280 x 720 pixels at 50p (HD: 17Mbps / AVCHD) (Sensor output is 50fps). In the MP4 format it offers 1920 x 1080 pixels at 25fps (FHD: 20Mbps / MP4), 1280 x 720 pixels at 25fps (HD: 10Mbps / MP4) and 640 x 480 pixels at 25fps (VGA: 4Mbps / MP4). There's also a High Speed mode that shoots 1280 x 720 pixel movies at 100fps or 640 x 480 pixels at 200fps. AVCHD features almost double the recording time in HD quality compared with Motion JPEG, but software support is currently a bit thin on the ground. Panasonic describe it as the best mode for playing back on a HD TV direct from the camera, and MP4 best for email and playing on a computer. The TZ40's various movie options are sensibly stored in an easy to understand Motion Picture menu. Stereo sound is recorded during capture, helped by the wind cut function. You can also use the zoom lens during recording and really make the most of that 24-480mm focal range. Also new to the TZ40's movie mode is the Level Shot function which automatically detects the horizon in the frame and and keeps it even in the recorded movie even if the camera is tilted - very clever. On the negative side, you'll find that the lens zooms more slowly than when shooting a still image, and if you choose continuous auto-focus, areas of the video will be blurred before becoming sharp again as the camera tries to refocus. The HDMI port allows you to connect the TZ40 to a high-def TV set, but only if you purchase the optional HDMI mini-cable. The DMC-TZ40 has a 3D Mode option. When selected, the camera instructs you to pan 10cms from left to right, during which it takes 20 consecutive shots at high-speed, another benefit of the high-speed sensor. It then automatically selects the best 2 shots from the sequence to create a 3D image. You can only view the results on a 3D TV (the TZ40 records standard MPO files), and although it isn't as effective as images taken with Panasonic's 3D Micro Four Thirds lens or the Fujifilm 3D W3, for example, it does create quite a convincing effect which particularly suits subjects that are close-up to the camera. The clever Intelligent Resolution feature performs two main functions - it either makes a standard image look like a higher resolution one by processing the contour areas, texture areas and smooth areas individually, or it digitally boosts the zoom magnification from 20x to 40x with minimal loss of quality and no reduction in resolution. In both cases, it's easy tell which image was taken with Intelligent Resolution turned on and which ones with it turned off, particularly if viewing onscreen at 100% magnification, as our test shots on the Image Quality page show. The difference isn't quite so apparent on a print up to A3 in size, but we're not convinced enough to recommend it except when you really need the extra reach - it undoubtedly improves on the digital zoom, but not so much that we'd regularly use it. On the rear of the camera is the Q.Menu button which provides quick access to most of the principal controls, including ISO speed, image size, image quality and white balance (there are 7 settings in total). You can still access all of these options from the main menu system too. In addition the TZ40 also has an Exposure button, which in conjunction with the arrow keys on the navigation pad allows you to change the aperture and/or the shutter speed if you're using the A, S or M shooting modes. This two-button system isn't the most convenient, but it does avoid making the camera too cluttered. The large 3 inch LCD screen is the only way of framing your shots, so if you have to have an optical viewfinder, look elsewhere now, but we found that the high resolution 920K pixel screen coped admirably with the majority of lighting conditions, even being nice to use in low-light. There's a clever function called High Angle, accessible from the Quick Menu, which essentially brightens the LCD screen when the camera is held over your head so that it is perfectly viewable, which is great for shooting over the heads of a crowd. The Intelligent LCD function automatically detects the current lighting conditions and boosts the LCD backlighting by up to 40% when shooting outdoors in bright sunshine, helping to keep the screen visible. One of the DMC-TZ40's main innovations remains its touchscreen interface. The most immediately noticeable function is the ability to use the 1-area AF mode to focus on your main subject simply by touching it on the LCD. If the subject then moves, the DMC-TZ40 cleverly follows it around the screen using the the AF tracking function. If the subject exits the frame entirely, simply recompose and tap it again to start focusing. Impressive stuff that makes focusing on off-center subjects fast and intuitive. It is a little too easy to accidentally press the screen and set the focus point to the wrong area for the current subject, but a simple tap in the middle of the LCD will center the AF point (or you can turn this feature off altogether). When Intelligent Auto is switched on, the DMC-TZ40 changes the scene mode used when you touch the subject, for example selecting portrait mode if you touch a face and macro mode if you touch a close-up flower. If you prefer to manually focus rather than use the snappy AF, you can magnify any part of the subject by 1x, 5x or 10x by simply dragging the image around the screen. The final touchscreen ability from an image composition point of view is the ability to release the shutter, with a small icon on the right hand screen enabling this functionality, and then a single on-screen tap all that's required to take the picture. Most of the menu options can be changed via the touchscreen interface, notably the Quick Menu and the Info Display menu - the main exception to this rule is the Main Menu, which is still controlled via the navigation buttons. You can also control image playback by touching the screen, with the ability to tap a thumbnail to see the full-size version, scroll through your images by dragging them from side to side, and magnifying them up to 16x by using two fingers to pinch-zoom. The TZ40 has an anti-shake system, on this model the POWER O.I.S. variety enhanced with a new 5 Axis correction and inclination correction system that counteracts any tilt or handshake. Turn it on and the Panasonic Lumix DMC-TZ40 automatically compensates for camera shake, which is a slight blurring of the image that typically occurs at slow shutter speeds when the camera is hand held. When shooting video, Active Mode is automatically added to the POWER O.I.S. system. This compensates for the extra blur that can occur when you're walking and shooting video at the same time. There are two different modes, Mode 1 is on all the time including image composition, and Mode 2 is only on when you press the shutter button. An Auto setting is also available if you're not sure which one to use. Panasonic claim that the POWER O.I.S. system is twice as effective as the older MEGA O.I.S, and while its difficult to make a direct comparison, we found that it does make a noticeable difference, as shown in the examples on the Image Quality page. You don't notice that the camera is actually doing anything different when anti-shake is turned on, just that you can use slower shutter speeds than normal and still take sharp photos. The TZ40 has a respectable battery life of 300 shots. Note that the camera battery is now rather inconveniently charged via the USB port, rather than a separate charger, so it's a good idea to invest in some extra batteries. Panasonic also provide a High Sensitivity Mode to help combat the effects of camera shake. When this scene mode is selected, the TZ40 automatically raises the ISO speed up to a maximum of 12800 and therefore allows for a faster shutter speed. This mode allows you to handhold the camera without using the flash and get more natural results, whilst at the same time freezing subject movement more successfully. There are some obvious drawbacks with this special scene mode, principally a significant increase in noise and blurring - Panasonic state that "Pictures may appear slightly grainy due to high sensitivity". You also need to select the scene mode and therefore have some idea about when it is applicable to your subject. The Intelligent ISO mode is the third way in which the DMC-TZ40 attempts to avoid subject blur in low-light conditions. The camera automatically sets the appropriate shutter speed AND ISO speed for the subject that you are taking pictures of. So if you're taking shots of a child indoors, the DMC-TZ40 automatically raises the ISO and in turn the shutter speed to avoid blurring the child's movement. If the subject is still, then the camera chooses a lower sensitivity and slower shutter speed. It's a clever idea that works well in practice, with the camera generally choosing an appropriate combination of shutter and ISO speed. You can also limit the maximum ISO speed that the camera can choose, which we'd strongly advise, as ISO 3200 produces very noisy images - ISO 1600 is a better maximum setting. The main menu system on the Panasonic Lumix DMC-TZ40 is accessed by pressing the Menu/Set button in the middle of the navigation pad. There are five menu options, Record, Motion Picture, GPS, Setup and Wi-fi. Most of the camera's main options, such as white balance, image quality, auto-focus mode and ISO speed, are accessed here. As mentioned previously, the addition of the Quick Menu button on the rear of the camera speeds up access to some of the more commonly used options. Due to the large LCD screen and restricting the number of on-screen choices to five, the various options and icons are very clear and legible. If you have never used a digital camera before, or you're upgrading from a more basic model, reading the easy-to-follow manual before you start is a good idea, especially as a few of the buttons are specific to Panasonic cameras. Thankfully Panasonic have chosen to supply it in printed format, rather than as a PDF on a CD, so you can also carry it with you for easy reference. The start-up time from turning the Panasonic Lumix DMC-TZ40 on to being ready to take a photo is quite quick at around 2 seconds. Zooming from the widest focal length to the longest is very slow at around 5 seconds, but focusing is very quick in good light thanks to the Light Speed AF system (fastest focusing speed of 0.1 seconds), and the camera achieves focus most of the time indoors or in low-light situations, helped by the focus-assist lamp. Note that the camera does struggle to lock onto the subject at the tele-photo end of the lens in low-light situations. 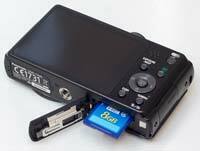 It takes about 1 second to store an image, allowing you to keep shooting as they are being recorded onto the memory card, with a delay of 0.3 seconds between images. The Panasonic Lumix DMC-TZ40 has an impressively quick Burst mode which enables you to take 10 frames per second for 4 shots with the focus fixed according to the first frame at the full 18 megapixel resolution. There are also slower 5fps or 2fps burst modes which offer continuous auto-focusing during the burst, and faster 40fps and 60fps options that drop the megapixel count to 5 and 2.5 respectively. Once you have captured a photo, the Panasonic Lumix DMC-TZ40 has a good range of options when it comes to playing, reviewing and managing your images. You can instantly scroll through the images that you have taken, view thumbnails (up to 30 onscreen at the same time and in a special Calendar view), zoom in and out up to 16x magnification, view slideshows, delete, protect, crop, resize and copy an image. You can also select favourite images, sort images into categories, add a text stamp, add a soundclip and set the print order. Face Recognition plays back only the photos that contain a certain face. The Display button toggles detailed settings information about each picture on and off, such as the ISO rating and aperture / shutter speed, and there is a small histogram available during both shooting and playback. When taking a photo, pressing the Display button toggles between the detailed information, the detailed information plus gridlines to aid composition, and no information at all.